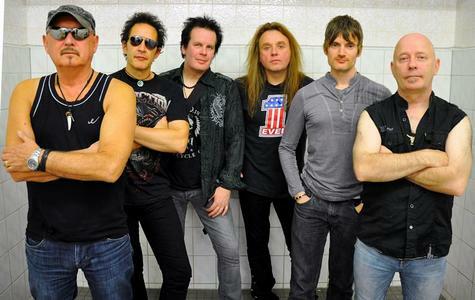 Veteran NWOBHM act Demon have held the metal flag high for nearly 40 years at this point. Their most thirteenth and most recent effort, Cemetery Junction, was originally released last year overseas via Spaced Out Music and is now available stateside through Clay Records/Restricted Release. We at DR are hosting the premiere of a 2-song video/mini-movie for “Someone’s Watching You” and the title track, which can be seen below. It’s an elegant pairing of the two tracks, with “Someone’s Watching You” having a slightly spooky vibe that slowly builds itself up, centering itself on Dave Hill’s vocals. “Cemetery Junction” has that classic NWOBHM vibe with some hooky riffs and a melodic solo offering some balance with Hill’s strong vocal presence. As for the video itself, there’s a nice blend of the band playing alongside a classic horror tale that builds to an intriguing climax with an satisfying twist. To give away provide any further details there would deprive the viewer from the complete experience – check it out!